Data growth continues unabated and at an unprecedented rate. This explosion of data represents a massive challenge to IT. 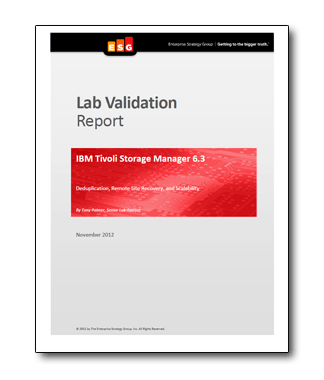 Tivoli Storage Manager (TSM) from IBM provides a turnkey solution to a range of data protection issues. This free ESG Lab Validation focuses on key improvements in the TSM platform that drive greater scalability, efficiency, and availability, detailing how and why TSM distinguishes itself from comparable solutions through a range of features. Read on to find out why TSM is the right storage management choice for your organization.